The Boothbay Mirror compliments the Boothbay Bedroom series. The mirror comes in a variety of sizes and of course any of our standard wood species. This mirror was done in cherry and has walnut inlays in each of the corners. 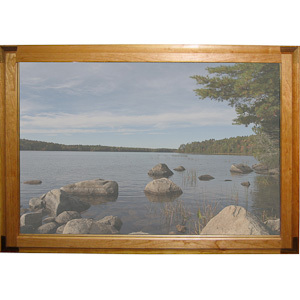 The cove detail classic to the Boothbay series lines the perimeter of the mirror. The mirror is designed to hang from the wall. Other sizes mounting options are available. Please inquire about other options.